When talking about Hakka music, people naturally think of mountain songs. A 120-minute concert of pop songs in the Hakka dialect — a deviation from the age-old folk tradition — held Saturday afternoon was an eye-popping experience for music fans. 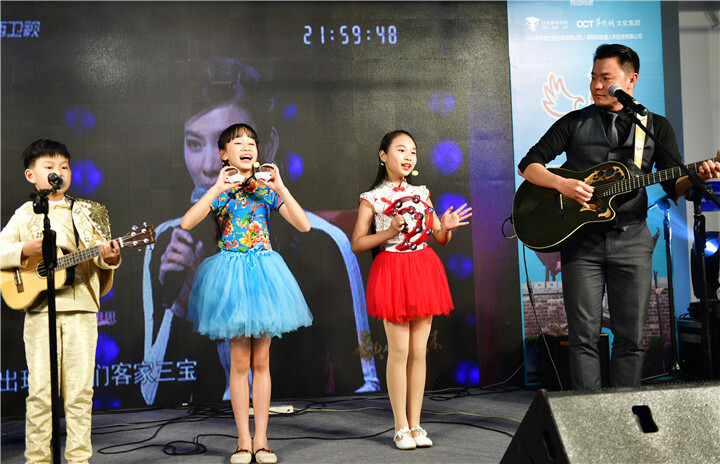 Held in the historical Nanxianglou Building in Gankeng Hakka Town in Longgang District, the concert brought together the representatives of Hakka children’s songs, pop songs, ballads and rock songs on the Chinese mainland. 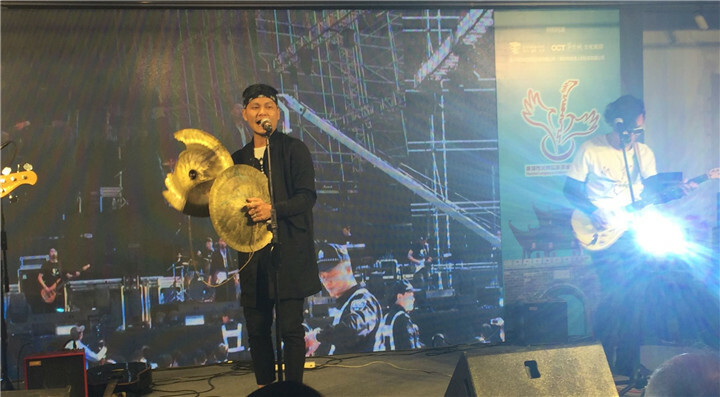 Opening the concert was Xue Yongjun and his team of drummers, which was followed by Chen Shanbao, whose team of young singers performed a medley of children’s Hakka songs. Chen Shanbao (R) and his team of young singers. Zhang Jianfeng, producer of the concert, praised Chen’s efforts in promoting children’s Hakka songs. “Our cultural traditions will not die out only if our children can identify and resonate with them,” he said. More akin to the traditional mountain songs, the children’s songs are melodious and catchy. 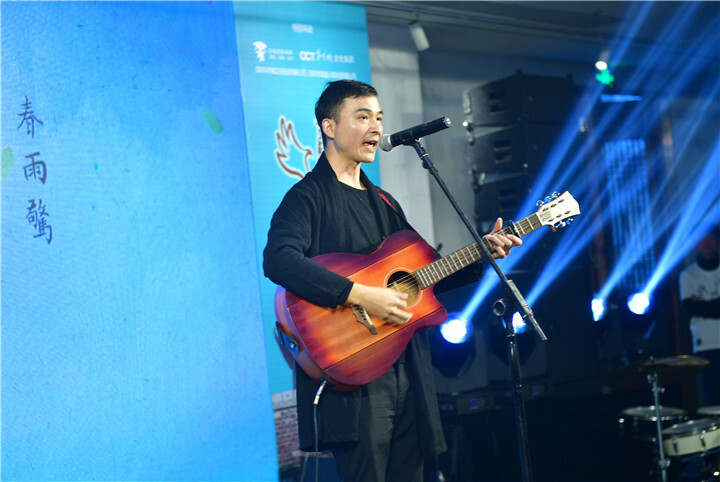 The highlights of the concert were gigs by Zou Jinlong, a representative of Hakka rock, and Qiulin, named the best Hakka singer at the 29th Golden Melody Awards in Taiwan this June. Qiulin’s “At the Foot of Daling Mountain” was from his second album of the same title. The singer also performed “24 Solar Terms,” which he wrote as a tribute to the hard-working Hakka farmers. Zou Jinlong and his band. When Zou Jinlong and his band performed “Big Hakka” on stage, the audiences were ignited and clapped their hands to accompany the song. With lyrics by Zhang and music by Zou himself, the song popular among Hakkas was downloaded thousands of times at online music streaming sites. Zou also performed “I Am a Hakka,” a song from his 2016 album of the same title. Hakka people, a Han Chinese subgroup, migrated from China’s central plain to what is modern day’s southern China during the 6th to 13th centuries, and mixed with local non-Han ethnic groups such as the Miao people. Also influenced by the cultures of their new surroundings like the Cantonese, Hakka culture encompasses a shared dialect, various art forms, foods, folklore and traditional customs. In 1981, Taiwan singer Wu Shengzhi released the first pop album featuring songs in the Hakka dialect, starting the Hakka pop trend. In 2003, the Golden Melody Awards added a category to recognize Hakka singers. Saturday’s concert also marked the founding of the Longgang Hakka Pop Music Association (LHPMA), the first such organization on the Chinese mainland. 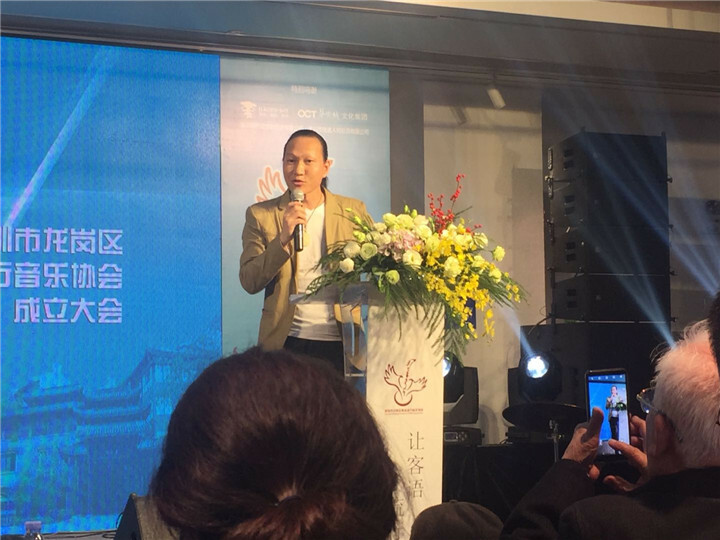 Yao Feng, president of the Shenzhen Musicians Association, endorsed the efforts of these pop musicians and also called for government support for such efforts to diversify the local music scene.